Steiff Christmas Baker Teddy Bear Discounts Apply ! Made from The Finest High Quality Reddish Blonde Mohair. Wow, what a wonderful smell... The door to the Christmas bakery is slightly ajar and there, laid out on the table, is a baking tray of delicious biscuits. They have been baked with loving care into the shape of rocking horses. The creator of these wonderful biscuits is proudly holding up one of the rocking horses in his right hand. It is made of lavishly embroidered felt. Hanging from his left paw by a satin ribbon, is the cookie cutter he has used to make the biscuits. 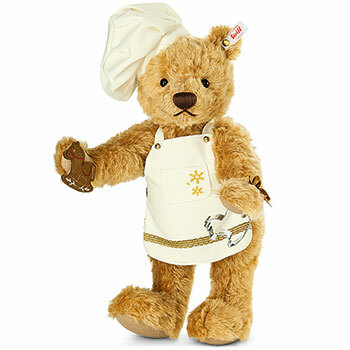 Snowflakes embroidered in gold thread adorn the bears crisp white apron and golden buttons complete the outfit. The bear is wearing a bakers hat cheekily tipped to one side over its right ear . Hi he arrived safe and he is Superb.